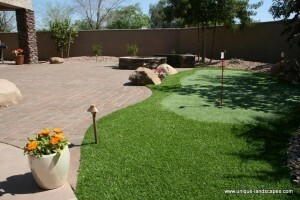 Artificial turf or synthetic grass gives you the beautiful, low-maintenance lawn of your dreams. Lush and lifelike, the synthetic surface utilizes a soft polyethylene UV protected synthetic fiber to produce a realistic “fresh cut” appearance combined with a soft, pleasing feel. Artificial turf is a surface of synthetic fibers made to look like natural grass. It is typically used on residential lawns and commercial applications as well. The main reason is maintenance—artificial turf stands up to heavy use, such as in sports, and requires no irrigation or trimming.